For 2015, the Chevy Spark mini-car gets standard OnStar 4G LTE Wi-Fi service. It’s free for the first three months or 3GB of data use, whichever comes first. After that, prepare to receive a regular bill. There are five flavors of Chevy Spark from which to choose: LS, 1LT, 2LT, EV 1LT, and EV 2LT. Each is remarkably well equipped, even the base Spark LS. Nevertheless, if you select the Spark 1LT you’ll benefit from a Chevrolet MyLink touchscreen infotainment system with a USB port, satellite radio, and extra stereo speakers. This model also comes with floor mats, cruise control, power exterior mirrors, power door locks, remote keyless entry, and more. Upgrade to the 2LT for leatherette seat upholstery, a leather-wrapped steering wheel, heated outside mirrors, sportier trim, fog lights, and special aluminum wheels. The Spark EV 1LT is an electric version of the car, and includes everything except leatherette seats and a leather-wrapped steering wheel as standard equipment. Guess that the EV 2LT model adds? Yep, you guessed it. 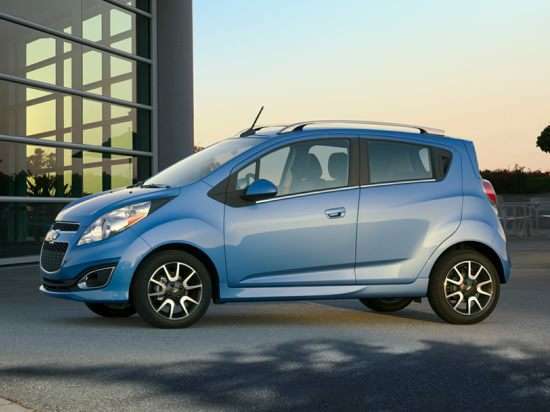 The Spark’s standard 1.2-liter 4-cylinder gasoline engine generates 84 horsepower and 83 lb.-ft. of torque. Remember, this is a very small, 4-passenger car, so with just the driver aboard it actually feels rather lively. A 5-speed manual gearbox is standard, with a continuously variable transmission (CVT) optional. The Spark EV has an electric motor making 140 horsepower and 327 lb.-ft. of torque from the moment you step on the accelerator pedal. Though heavier than a standard Spark, the Spark EV is nevertheless the performance car of the family, getting to 60 mph in 7.2 seconds, according to Chevrolet. Whether you choose the standard manual transmission or the optional CVT, the Spark is rated to get 34 mpg in combined driving. Go with the Spark EV, and Chevrolet says you can get up to 82 miles of range on a fully charged battery. In crash tests, the 2015 Spark earns a 4-star overall rating from the NHTSA. According to the Insurance Institute for Highway Safety (IIHS), the Spark is the only car in its class to earn a “Top Safety Pick” rating. However, keep in mind that this accolade is relative; the Spark is, by far, much smaller and lighter than most of the vehicles with which it might collide. Equipped with standard OnStar service, including Automatic Crash Response for the first six months of ownership, the Spark now offers 4G LTE high-speed Internet access, transforming the car into a mobile Wi-Fi hotspot. The Spark’s available Chevrolet MyLink infotainment system provides a 7-inch color touchscreen infotainment display, and features smartphone connectivity for access to a world of music via Pandora, Stitcher, and TuneIn apps. Apple iPhone users will enjoy Siri Eyes Free compatibility, and the system can be upgraded with an affordable BringGo navigation app. The Spark EV is equipped with a charger compatible with a standard household outlet. Faster charging is available with the optional 240-volt setup, reducing the charging time to a claimed seven hours.